Most people that don’t sew have a mistaken notion that sewing your own clothes is a money-saver. Holy Hannah, is that far from the truth! 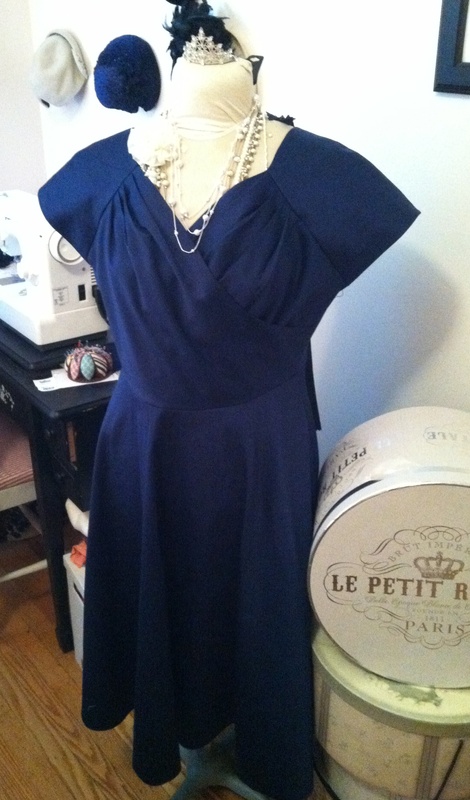 Case in point: the dress I made for Peter’s sister’s wedding. 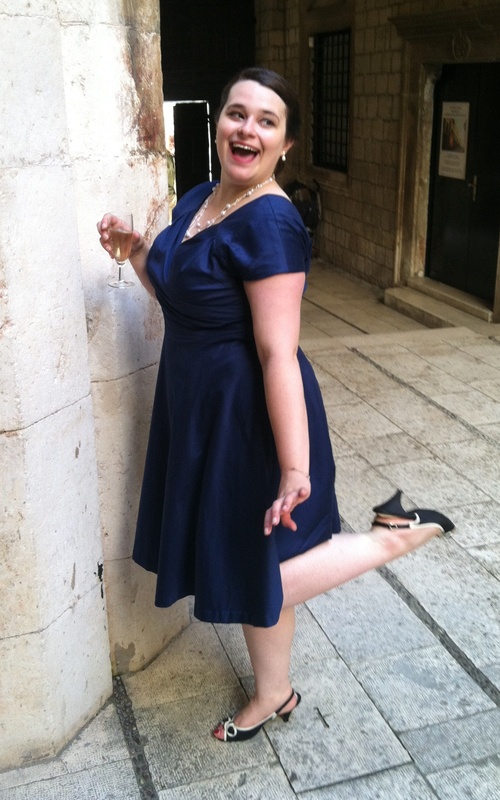 It would have been much cheaper (and time-efficient) to buy something from Modcloth, which I did consider. Unfortunately, it takes like 10 days for anything they ship to me to reach my front step, and then there’s always a risk that once it does show up, it won’t fit. So, I decided that sewing a dress would probably be my best bet. 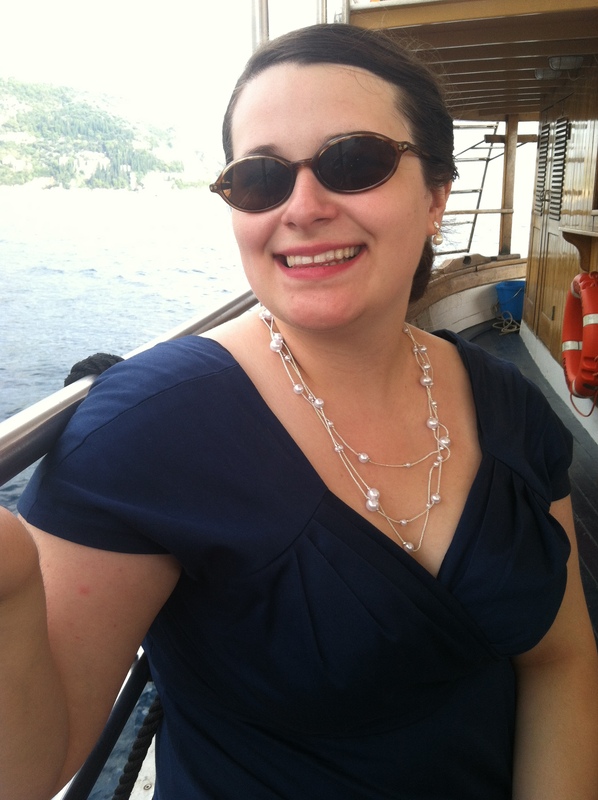 I knew I wanted to wear a fancy wrap dress in a shade of blue, and after looking at numerous patterns, I chose Butterick 5983, which has a lovely wrap dress bodice that is pleated at the shoulders. Luckily, I made a muslin mock-up first, as there were several alterations that needed to be done. First, I shortened the length of the circle skirt about 9 inches, so that it was knee-length, rather than tea-length. I also pinched in the shoulder seam, as it was too full for my shoulders. As for fabric, I used a gorgeous Kenneth Cole blue cotton sateen that I got locally at Mill End Fabrics. I love this fabric, it has a great satin feel to it, but because it’s a cotton, is way easier to work with. I also bought several yards of lace fabric to create an overlay over the sateen, but when I got the fabric home and saw the two together in non-fluorescent light, they just didn’t work together, so I had to scrap that idea. Hopefully, I can use the lace for another project, as it’s really lovely. The back closes with a hand-pricked lapped zipper (somehow I didn’t get a photo of that, sorry!). I didn’t do this to be fancy, but rather, because somehow I’ve managed to lose both of my zipper feet for my machine (this is one of the reasons I hate moving, people). I’m sure it’s somewhere in the sewing/craft stuff, but in the rush to get this dress done, I really didn’t have the time it would take to thoroughly look for it, so hand-pricked zipper it was! This was my first time using this technique, and I actually really like it! I found I got way more control with hand-sewing it (the zipper pull is always getting in the way when I insert zippers by machine), and it also looks neater than my machine-sewn zippers. 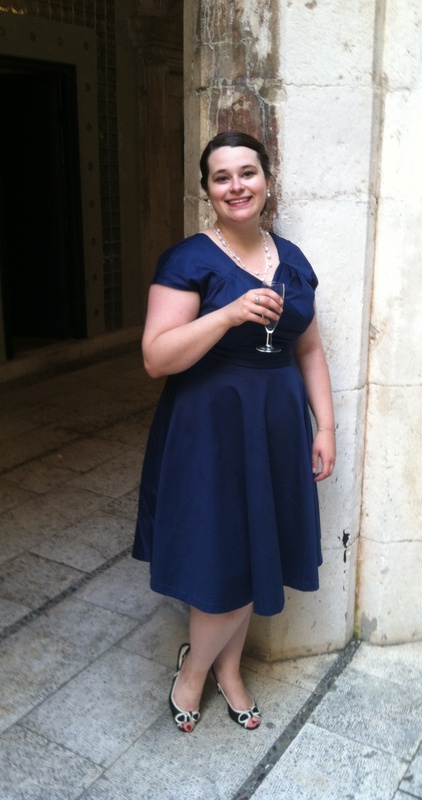 Despite being sick as a dog on the day of the wedding, I had a great time and got so many lovely compliments from everyone on the dress (which they couldn’t believe I had made myself!). It definitely made the hectic last-minute sewing worth it. 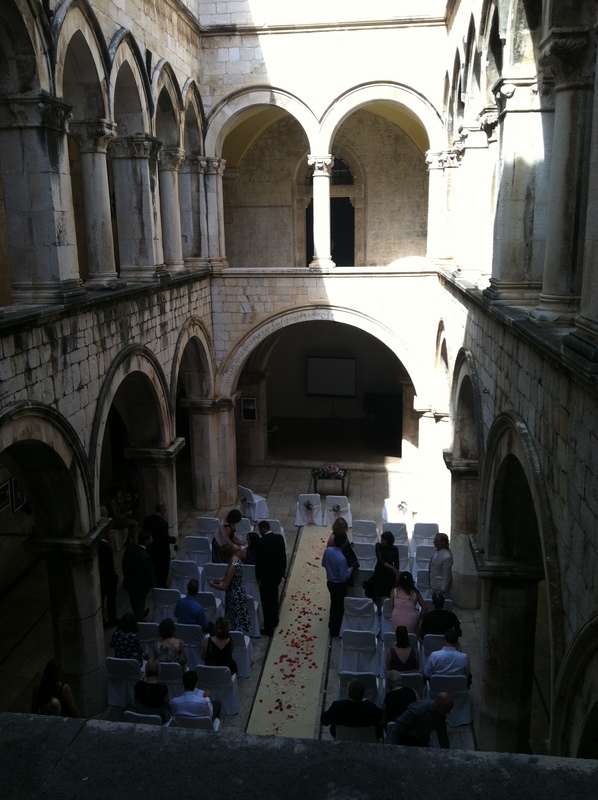 The wedding ceremony took place at the Sponza Palace, a 16th-century building in Dubrovnik’s Old Town. Afterwards, we walked out to the harbor and took a boat ride around one of the small islands, before reaching shore again for the reception at The Grand Villa Argentina. The wedding ceremony and reception were absolutely gorgeous, and I’m so grateful that I was able to attend!